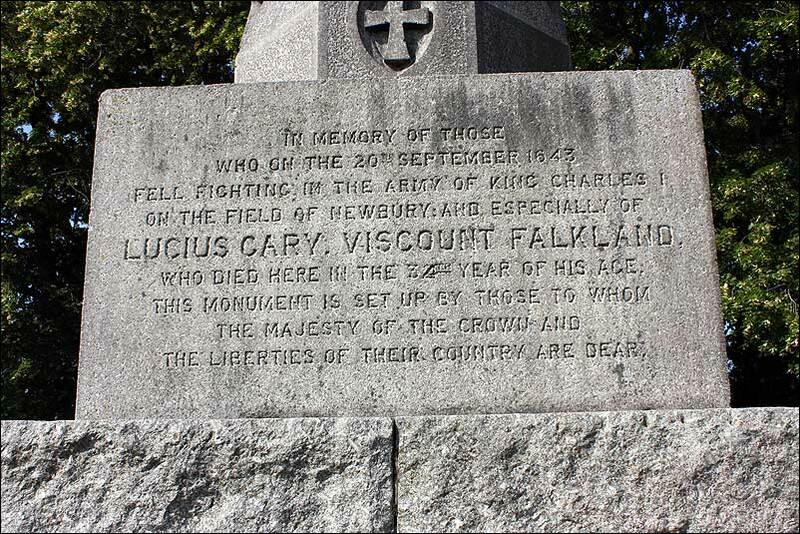 The Falkland Memorial was erected in 1878 and was originally to commemorate everyone who fell at the first Battle of Newbury (20th September 1643). It is a distinctive landmark at the junction of Essex Street with the Andover Road. "The Falkland memorial was put there in 1878 by some local person with a penchant for the civil war. 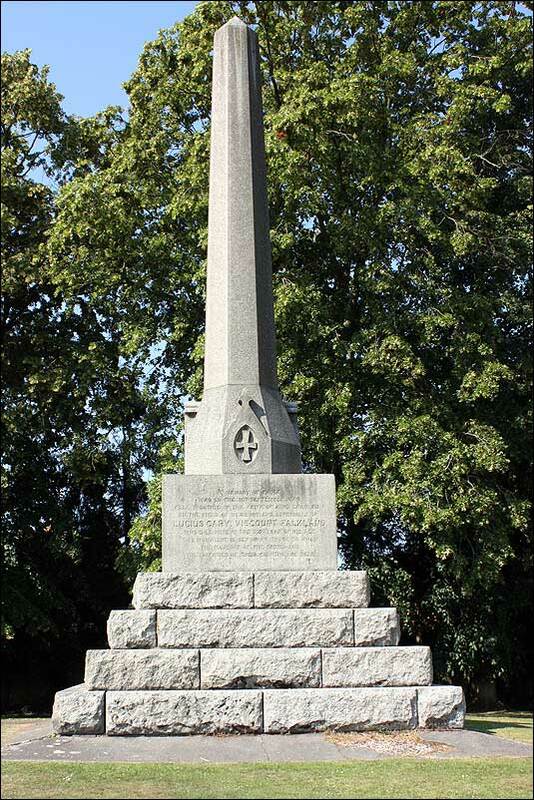 The finance was raised locally but the person who organised it wanted it to commemorate all those who fell in the battle but was outvoted by the Earl of Carnarvon and the members of the committee who wanted a Royalist memorial. And, so it was. The design was by local architect John Money and carved out of Cornish granite brought at great cost from a couple of Cornish quarries and crafted by a Penryn company"
The lead lettering that used to spell out the inscriptions has long gone to the scrappie - a shame as the Latin and Greek inscriptions are now indecipherable. The subscription to build the memorial was run by the Newbury District Field Club, led by Walter Money (author of The Battles of Newbury, brother of the architect). The main contributor was the Earl of Carnarvon (he may even have given the land) - so he had the say on the wording. James Money seems to have been the Patrick Griffin of his day. The Field Club is still going - some might be interested in its programme of local history talks (see www.ndfc.org.uk). Perhaps we should raise a new subscription to generate the funds to modify the inscriptions - perhaps remove the Latin and Greek and commemorate the Parliamentarians on that side. Just a thought, prompted by this interesting post; what about erecting a similar monument which commemorates the second battle? That could have a Parliamentary bias and so balance the local sentiments. Possible site at the junction of Kiln Road and Pear Tree Lane which was possibly the southern edge of the Parliamentary camp.